Inside Toronto has written a wonderful article about Parkdale and some of the amazing people and agencies who make Ward 14 and its communities great. Please pass it on to your friends and neighbours. Roncy Rocks 2012 – Calling all local artists, filmmakers and more! The RVBIA has put out the call for Roncy Rocks 2012, the an annual day-long celebration of art, music and culture in Roncesvalles Village. The annual Plant Fair will take place on Saturday May 12, 2012, from 10:30am to 1:30pm at the Parkdale School and Community Centre (75 Lansdowne Ave – At Seaforth). Sales are Cash Only. “Over the years the Plant Fair has become a fixture of the spring season. It is a wonderful day of mixing, mingling and chatting over plants and Green Elephant bargains. Spirits are high, the refreshments are tasty and when your arms are full just ‘park’ your plants with our plant minders and continue to browse. The Plant Fair also offers an opportunity to purchase Raffle tickets (winners to be drawn May 28) orGarden Tour tickets. The Plant Fair is the largest of the Hort yearly events. It is also a time when well over a hundred Hort volunteers mobilize like a well oiled machine to bring not only member’s plant divisions into the community, but also their expertise. Plants of every description fill the tables. Standard nursery stock and the basic annuals of the season will also be available. A Connoisseur’s Table will offer items aimed primarily at Hort members or experienced gardeners looking for the out of the ordinary. Want to become a Citizen TTC Commissioner? appoint@toronto.ca to give the City of Toronto their name, email address, address and that they “wish to be considered for the TTC Commission”. They will then be added to the Public Appointments Interested Persons List. This process will start in mid-June, according to the City’s website. Also, suggest that they periodically check the Public Appointments webpage for updates. 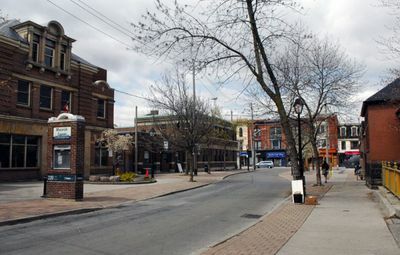 The Parkdale Community Information Centre is a non-profit charitable community services organization committed to meeting the diverse and changing needs of the Parkdale community through the delivery of accessible, effective programs and services. The have asked us to spread the word that they are looking for Community Outreach & Development Coordinator. Endorsed by the City of Toronto, Quench is a free mobile App that connects you to the nearest water fountain or re-fill location in the GTA to fill up your water bottle. The initiative by TVO’s ‘The Water Brothers’ seeks to promote re-usable water bottle and reduce the waste created by plastic bottles (146 million plastic bottles end up in City landfills each year!). “In July of 2008 and again in June of 2010, Budapest Park, which is situated at Parkside Drive and Lakeshore Boulevard West in the western beaches area, experienced flooding of the park area, including Sunnyside Gus Ryder pool. The floodwater was a combination of rain and sewage which overflowed due to unusually high rainfall levels that exceeded the drainage system’s capacity and damaged existing sewers. The City is investigating a permanent flood prevention solution, which requires further study and analysis. In the interim, to guard against flooding in the park area during extreme weather, we will be building a temporary relief channel (swale) along the boardwalk, south of the bicycle path, to direct stormwater away from public use areas. The work will require removing a portion of the boardwalk and moving a memorial tree to a new area in the park. The family has granted permission for the relocation of the tree. The Ministry of the Environment and Toronto Public Health have been informed of the project. Work will begin in May 2012 and is expected to conclude by the end of June 2012. We expect to install a permanent solution by 2014-2015. The crews are actually planning to start work on Monday. 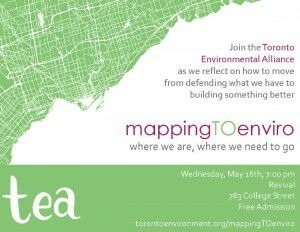 Toronto Environmental Alliance, Summer Student Jobs and Public Event: "MappingTOenviro"
The Toronto Environmental Alliance is hiring students to do community outreach this summer. To find out more see: Student Summer Jobs or attend their meeting tomorrow. Concerned about the environment and want to see a greener Toronto? Please see the message below from the Toronto Environmental Alliance. I would like to invite you to a fun evening of networking, inspired discussion about where we are and where we want to go, and a preview of some of the changes happening at TEA. As you know, it’s been almost a year and a half since the current council was sworn into office, and in that time significant changes have happened on the environmental front. Important environmental programs and services were under unprecedented threat. But thanks to the work of our team, TEA members, and our allies, we succeeded in stopping proposed cuts to those programs and services in January. Then, we witnessed a historic transit victory that will bring efficient, rapid transit to Toronto sooner rather than later. None of this would have been possible without the work and support of Torontonians like you. It’s important to reflect on what this success means for us as community organizers and advocates for the environment, and to begin planning how to move beyond defending what we have toward building something better. And as we switch gears from defending to building, TEA itself is at a turning point as an organization – and we’d like to give you a sneak peak at that transformation. We are reaching and engaging our members in new ways, spreading our roots throughout the city, and changing our look. As we work on growing our membership, we look forward to planning a new phase of building a greener Toronto for us all. And we need your energy and wisdom to do that. 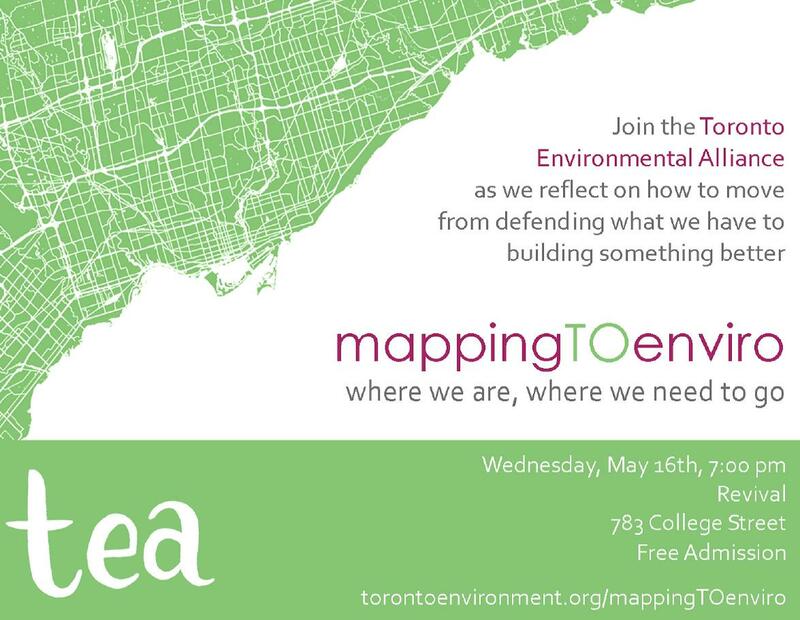 So please join us on Wednesday, May 16th, 7:00 pm at Revival Bar at 783 College Street as we come together to relax and have fun while we map out our next steps toward building a greener city for all!